Armillary sphere on triple claw feet and inner wooden globe. 1554. 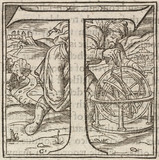 Engraved capital with armillary sphere, 1556. Small armillary sphere, 17th century. Diagram of celestial and terrestrial globes and armillary spheres, c 1805.